(Xinhua) Chinese Premier Li Keqiang on Wednesday wrapped up his four-day visit to Hungary with enhanced bilateral ties and China-Central and Eastern Europe (CEE) cooperation. During his talks with Hungarian Prime Minister Viktor Orban on Tuesday, Li said China is committed to further advancing bilateral cooperation so as to lift bilateral relationship to a new high. Speaking of the traditional friendship and solid foundation of bilateral ties between China and Hungary, Li said China views Hungary as an important partner in CEE, a good friend in the European Union, and a friend that can have close communication and coordination in international affairs. "We are willing to further deepen ties with Hungary on the basis of mutual respect and equal treatment so as to lift the traditional friendship and mutually beneficial cooperation to a new high," Li told Orban during the talks held at the National Assembly building of Hungary. China and Hungary lifted their relationship to comprehensive strategic partnership during Orban’s meeting with Chinese President Xi Jinping in Beijing in May. Hungary is among the first batch of countries that recognized the People’s Republic of China and established diplomatic ties with it on Oct. 6, 1949, days after its founding. Relations between China and Hungary have entered the best period in history with frequent high-level visits and mutual trust in practical cooperation. Hungary signed the memorandum of understanding over China’s Belt and Road Initiative in June 2015, becoming the first European country that has established and started the Belt and Road working group mechanism with China, which signified a successful docking of the China-proposed initiative with Hungary’s "opening to the East" policy. China is willing to better dovetail the Belt and Road Initiative with Hungarian development strategies, expand bilateral trade and investment scale, and enhance cooperation on key areas including infrastructure construction in the hope of promoting connectivity in the region, Li said during the talks. Proposed by President Xi in 2013, the Belt and Road Initiative aims to build trade and infrastructure networks connecting Asia with Europe and Africa on and beyond the ancient Silk Road routes. It comprises the Silk Road Economic Belt and the 21st Century Maritime Silk Road. Li said China encourages more Chinese enterprises to invest in Hungary and expects more facilitation from the Hungarian side, adding that China is willing to import more Hungarian products that are competitive on the market. China is Hungary’s most important trading partner outside Europe, while Hungary remains China’s third largest trading partner in CEE. Last year, bilateral trade volume reached 8.89 billion US dollars with a 10.1 percent year-on-year growth. In the first half of this year, two-way trade volume reached 4.85 billion dollars, a 17.3 percent increase over the same period of last year. The Chinese premier also called on the two countries to strengthen financial cooperation so as to make the country a major base for China-CEE financial cooperation. Currently, Hungary has the first Chinese yuan clearing bank in CEE. Li said China supports the two countries in expanding cooperation on tourism, civil aviation and education. 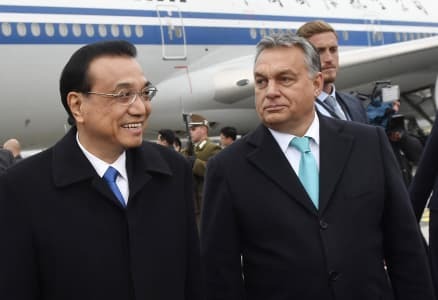 Orban, for his part, said Hungary and China enjoy very good political ties and have had fruitful cooperation, which could be called a success story in Hungary’s foreign relations. Hungary stands ready to accelerate the construction of such flagship projects as the Hungary-Serbia railway, enhance cooperation on economy and trade, finance, education and tourism, he said, adding that Hungary welcomes Chinese firms to invest in the country. The two countries signed 11 agreements covering areas of agriculture, e-commerce, finance, telecommunication, tourism and education. "These deals mean that China will further increase its investment in Hungary and help to make more job opportunities in the country," said Li when he and Orban jointly met with the press after their talks. "Such cooperation is also a good opportunity for Chinese companies to learn advanced technology and managing experience from the Hungarian side," he said. Accounting for one-third of China’s total investment in CEE, China’s current investment in Hungary has reached 4.1 billion dollars, creating about 10,000 local jobs, making the country the biggest investment destination of China in CEE. Orban said the two sides have had talks in a good and pragmatic atmosphere and reached a series of important consensus on deepening bilateral cooperation. Hungary and China enjoy solid ground for their relations and possess huge potential for cooperation, he said, expressing his hope that the current visit by the Chinese premier would open up new prospects for bilateral ties. Hungary is ready to seize the opportunities offered by China’s development, and strengthen exchanges and cooperation with China in all areas, he said. During his stay in Budapest, Li also met with Hungarian President Janos Ader and Parliament Speaker Laszlo Kover. He also received the Hungarian-Chinese dictionary edited and presented by Hungarian sinologists. Li’s Budapest visit also witnessed stronger cooperation between China and 16 CEE countries, dubbed as the 16+1 cooperation, as he attended the sixth meeting of heads of government of China and 16 Central and Eastern European Countries (CEEC) and seventh China-CEEC economic and trade cooperation forum. The 17 countries issued the Budapest Guidelines for the China-CEEC cooperation and signed deals on the Belt and Road Initiative, production capacity, infrastructure construction, finance and people-to-people exchanges. "My current visit is not only aimed at China-Hungary friendship, but also China-CEEC cooperation," said Li when met with the press on Tuesday. During Li’s stay, Serbia launched the construction of the Serbian part of the Hungary-Serbia railway, while Hungary announced the open tendering for the Hungarian part of the high-speed railway. Initiated in December 2015, the railway project will be built by Chinese companies led by China Railway Corporation. The origin of the so-called 16+1 cooperation could be traced back to the first China-CEEC Economic and Trade Forum held in Budapest six years ago, Li said. "Now that this cooperation mechanism has been running for five years, it is a perfect place and time to review the past and plan the future. The results in the past five years show that 16+1 cooperation benefits both sides as well as the world," Li said. Chinese investment in CEEC is now over 9 billion dollars, up from 3 billion in 2012, while CEEC invested 1.4 billion dollars in China. In the first three quarters this year, their trade exceeded 49 billion dollars, marking an increase of 14.5 percent year-on-year. China’s imports of agricultural products from CEEC have seen an annual increase of 13.7 percent. The two sides have also expanded infrastructure and industrial partnerships, with a number of flagship projects underway, including the Hungary-Serbia high-speed railway, the China-Serbia Friendship Bridge across the Danube in Belgrade, and highway projects in Macedonia and Montenegro. Li said this trans-regional cooperation mechanism has shortened the psychological distance between peoples of both ends of the Eurasia continent and reduced development imbalance arising from the process of globalization. It has contributed to the healthy development of globalization, the comprehensive development and integration of Europe, as well as regional stability and world peace, he said. Orban said his country will step up bilateral cooperation under the 16+1 cooperation framework and continue to promote fruitful cooperation between CEEC and China in order to make contributions to regional and global development. Hungary is the first leg of Li’s week-long visit starting Sunday. He is heading for Russia for the 16th meeting of the Council of Heads of Government (Prime Ministers) of the Shanghai Cooperation Organization to be held in Sochi, Russia from Thursday to Friday.